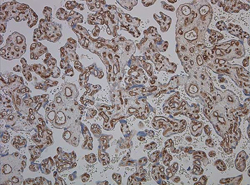 Paraffin processed placenta stained with Mouse Anti-Human CD34 class II (MCA547G). Stem cells are unspecialized cells that are able to give rise to a wide-array of somatic, differentiated cells. The ability of stem cells to originate every tissue under the proper physiological or experimental conditions has made them a subject of great interest, particularly with respect to their therapeutic potential. Bio-Rad provides a broad collection of stem cell antibodies guaranteed for use in key applications such as flow cytometry and western blotting. Embryonic stem cells (cells isolated from the inner cell mass of blastocysts) are pluripotent and can become virtually every tissue of the body. A wide range of cell surface markers and molecular markers have been reported to be indicative of this cell type. Takahashi and Yamananka (2006) found that under certain conditions terminally differentiated cells can be re-programmed into pluripotent stem cells. Like embryonic stem cells, these iPSCs have the ability to differentiate and become virtually any tissue. Adult stem cells reside in the tissues and have more limited differentiation potential, defined as multipotency. They are able to self renew, often after a long period of quiescence, and differentiate through symmetrical or asymmetrical divisions. Stem cells by their nature are subjected to different processes and fates that are governed by a variety of different signals. These include self renewal, quiescence, differentiation and apoptosis. A variety of markers are available to study stem cell signaling pathways. Nichols J et al. (1998). Formation of pluripotent stem cells in the mammalian embryo depends on the POU transcription factor Oct4. Cell 95, 379-391. Ramalho-Santos M et al. (2002). "Stemness": Transcriptional Profiling of Embryonic and Adult Stem Cells Science 298, 597-600. Takahashi K and Yamanaka S (2006). Induction of pluripotent stem cells from mouse embryonic and adult fibroblast cultures by defined factors. Cell 126, 663-676. Yu J et al. (2007). Induced pluripotent stem cell lines derived from human somatic cells. Science 318, 1917-1920. Zhao W et al. (2012). Embryonic Stem Cell Markers. Molecules 17, 6196-6236.